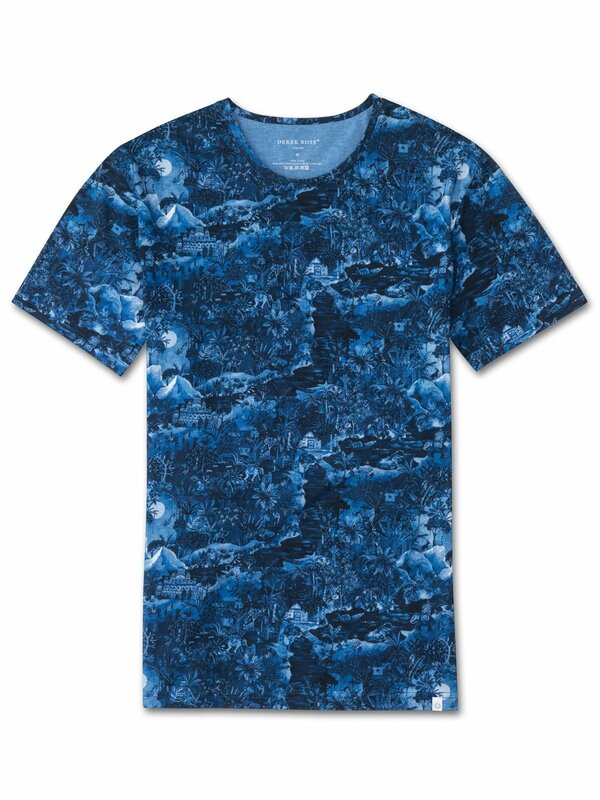 The detailed Henry 4 men's t-shirt is adorned with our signature hand-painted print of the season which takes you on a voyage through the waterways and rice paddies of Kerala, India. The riverbanks are bursting with wildlife and nature, with this dream-like scene also including elements of other areas of India, from the elephant polo of Jaipur to the grand palaces of Rajasthan. You may even spot an appearance from Derek in his Regimental pyjamas! The Henry 4 blue crew-neck is cut from pure cotton with a carbon-brushed finish for a truly luxurious handle and has small, thoughtful touches such as an extra soft neckband and narrow cover stitching for a refined finish. As always, our branding is kept subtle — with a discreet printed logo at the neck and a discreet flag label at the bottom of the t-shirt. Our sumptuously soft carbon-brushed cotton is exceptional at retaining both its colour and softness, even after continuous washing. Using a unique technique of carbon-brushing, the cotton fibres are softened and the finished garment is pre-washed to ensure a truer, more comfortable fit that won't shrink in the wash or deteriorate as you wear it. Part of our leisure and resortwear range, we have designed garments that embody our philosophy of 'Smart Comfort'; combining sumptuous fabrics with modern styling and considered details, thereby creating garments that can be matched with both off-duty clothing and smart-casual trousers.